As the northern states start preparing for winter golf enthusiasts may be mourning the end of a season. The good news is that there are many places where the golf season never ends one favorite being the Ko’Olina Golf Club on Oahu. 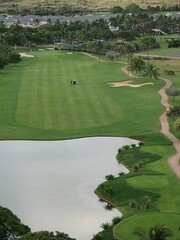 The Ko’Olina Golf Club offers a wonderful golf course which has hosted a variety of golf tournaments, including the LPGA. Playing golf is always more enjoyable in a beautiful setting and this Oahu location offers a stunning landscape filled with lush gardens and ocean views. For families who like to vacation together but not necessarily all play golf together the Ko’Olina Resort has many amenities to enjoy. From stunning beaches to shopping this Oahu resort has something for everyone.